27 Live goes Greek — Oompa! 27 Live is an Evanston music and events venue whose restaurant has had several lives in the recent past. I wrote about it last March when my wife and I enjoyed a meal there. It went through some menu changes (and some neighbors told me the food went a bit downhill). But now it’s reopened its restaurant companion as a Greek place, Kefi Greek Tavern. We went to check it out and found some dishes we enjoyed. The menu offers both small plate and large plate choices. We were in a bit fo a rush because we had play tickets the night we went, so our server advised us not to order some large plate options we wanted because they took 20 minutes to cook. So we instead made our meal out fo small plate offerings and we happy with the choices we made. 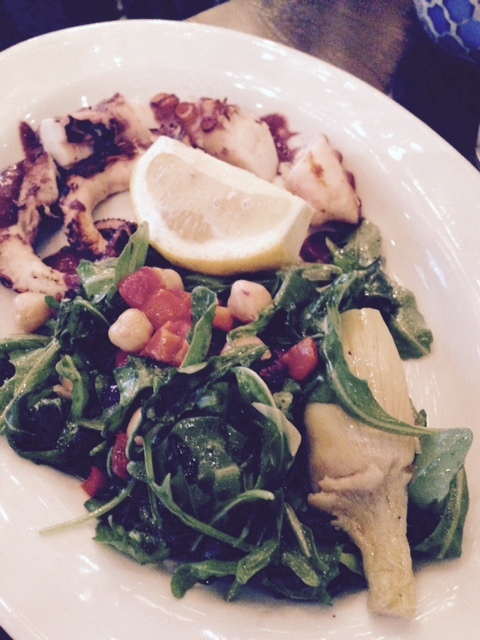 I went with the grilled octopus, which has become a go-to choice for me in Mediterranean places. It was wonderfully tender and the Kalamata vinaigrette was a tasty sauce for it. My wife ordered the Spanakopita and received a massive portion, enough or me to try a bit and to have left-overs to bring home. It definitely qualified as the biggest small plate entrée we’ve seen in a while. 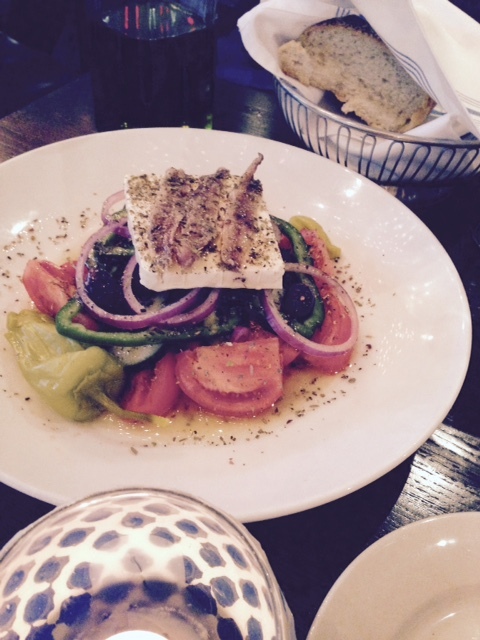 Kefi’s Greek Village Salad, fresh and delicious. The Greek Village Salad was large enough for us to split, which we did. It’s tomatoes were tasty and I enjoyed the anchovies as well while my wife ate the cheese (which I avoid these days because of fat and salt concerns). 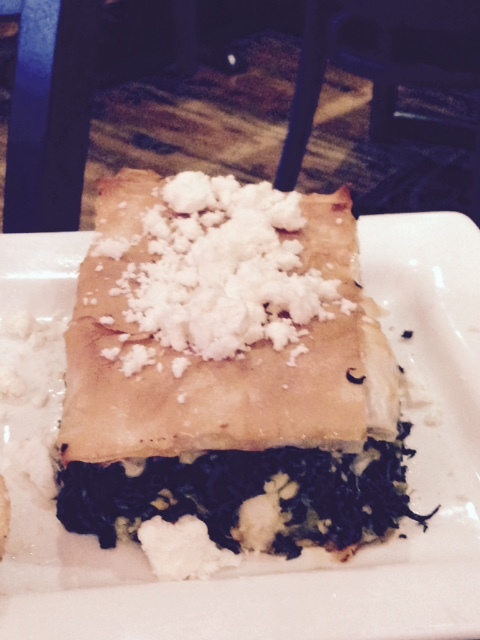 One quibble, we also ordered the saganaki which is traditionally flamed table-side in Chicago Greek restaurants. Ours never was. The menu calls it flamed, but not flaming, so maybe it was done in the kitchen. I missed the ritual of it flaming table-side while we yelled Oompa! I enjoyed our meal, we’ll have to try it again when we have more time to wait for the large plate offerings.